Discover the Carian coast in a traditional style, aboard the classic Turkish gulet Karia. She is an elegantly designed gulet sailboat that offers the comforts of luxury while cruising the Mediterranean coastline of Turkey. The Karia, comprises of 6 spacious and well designed cabins, each furnished with air conditioners and en suites, as well as plasma TVs for guest privacy in their cabin quarters. 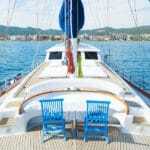 The Karia deluxe gulet comes with a professional and friendly crew of 5. 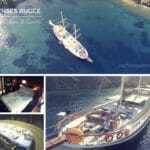 This 33 meter gulet ketch can cruise to the many destinations favored by travelers from around the globe. She is an ideal Mediterranean private yacht charter that is available during the months from April to the end of October. From the Eastern Mediterranean region all the way East, see the Carian coast and all the treasures it holds when anchored in key anchorage points. 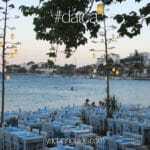 A few of the favored ancient Carian grounds can be found in the splendid city of Marmaris and Datca. Once a part of the Carian people is the city of Knidos situated on the tip of the Datca peninsula. There you will find treasures left behind from the Carian civilization. 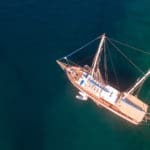 So if you’re seeking an alternative holiday overseas, with tropical climates, warm and friendly people, why not explore the Carian coast aboard a classic gulet, the Karia.